​I dare you to find a sunset anywhere in the world that beats an African sunset. I dare you. Sitting on the sundeck of The Royal Livingstone Victoria Falls Zambia Hotel by Anantara, pink gin in hand, a stone’s throw from the Zambezi River with the mist of the Victoria Falls visible on my left, hippos wallowing in the water in front of me, and pajamaed zebras grazing to my right these are the thoughts I entertain. Vic Falls, the colloquial name for the Victoria Falls, or Mosi-oa-Tunya, (the smoke that thunders as it was called when David Livingstone first laid eyes on it), is on the border of Zambia and Zimbabwe and it’s one of the Seven Natural Wonders of the World. Would I like another pink gin? Anything the butler assigned to my room needs to do? How about Dining by Design under the Monkey Tree tonight? 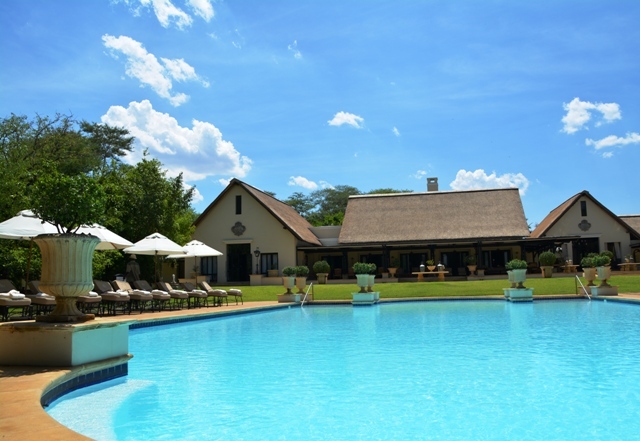 Staying at The Royal Livingstone Victoria Falls Zambia Hotel by Anantara makes you feel as if you are transported back to colonial times as far as leisure and service go. All along the baronial terrace and in the opulent lounge with paintings of Livingstone and lamp shades fashioned out of old books roof paddle fans gently swirl the air to add to the bucolic atmosphere. From 6h00 to 18h00 guests have unlimited access to the Victoria Falls on the Zambian side. The walk takes a few minutes through extended gardens where after you enter through a private entrance for a spectacular view of the falls. 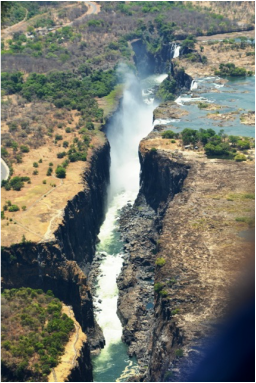 An exhilarating helicopter flip over Victoria Falls will make Livingstone’s words uttered in 1855 come true for you. He famously exclaimed that the falls offered “scenes so lovely that it must have been gazed upon by angels in their flight”. If you are a tad braver you could book an excursion to Livingstone Island, take a rocky walk and short swim to Devil’s Pool and sit on the edge of the sheer drop of the falls. This can only be done if water levels are low enough. ​I’d advise you not to miss out on these two activities to get the true feel of Africa but I have to add a word of caution: sometimes it’s difficult to tear yourself away from a breakfast that encompasses salmon with cream cheese, capers and lemon; fresh fruit skewers and slices of kiwi fruit; a large pastry table; charcuterie and a selection of cheeses; and to top it all an oversized parmesan wheel for slivers of cheese to be added to your hot breakfast selection. Once you have a glass of bubbly in hand you might just decide to extend your stay with a few more days. 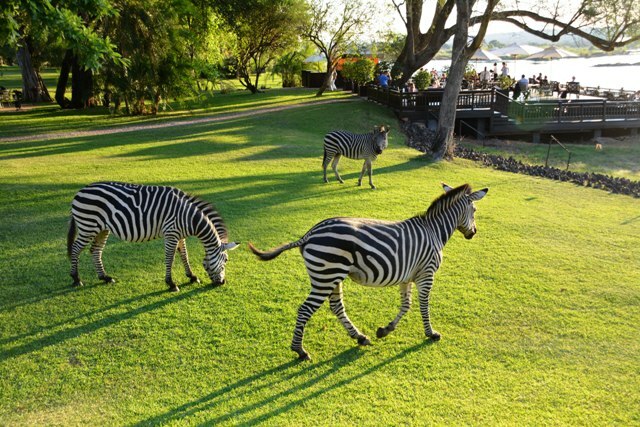 ​Should you opt for an adventurous excursion you’re bound to hurry back to watch the quintet of zebras grazing on the lawns in front of the terrace every day, totally unperturbed by guests. If you wake early you’ll catch the monkeys as they frolic on the hammock in the rolling gardens as if it has been especially put up for their benefit. 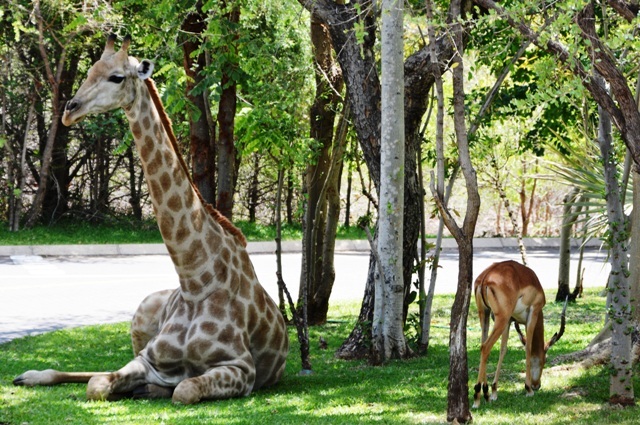 If you return from your heli flip in the early afternoon you might just find a journey of giraffes taking a siesta under the first trees once you have entered the leafy premises. Nothing could have prepared you for this experience. 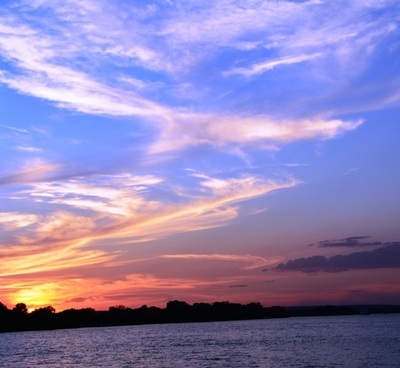 Least of all the thoughtful pilot who – on your flight into Livingstone – first issues a gentle warning that it might get bumpy but that this is due to hot air and that this route is flown every day by experienced pilots who know and live in Africa. The pilot then goes on to point out the landmark sights as the plane flies closer. On arrival at The Royal Livingstone Victoria Falls Zambia Hotel by Anantara you sit down for a welcoming hand massage before being shown to your air-conditioned room that remains a cool haven throughout your stay. Zambia falls under a sub-tropical climate so it’s no wonder that the pool – also overlooking the Zambezi – generally has dozens of loungers and bikini-clad visitors clicking away when the zebras and buck stroll past. From the pool it is a one-minute stroll to the sun deck that lures guests with the view, the finger snap service and their cocktails. How does one contemplate going anywhere else when the cry of a fish eagle permeates the sky, little boats flit to and fro and the occasional fish jumps out of the water? 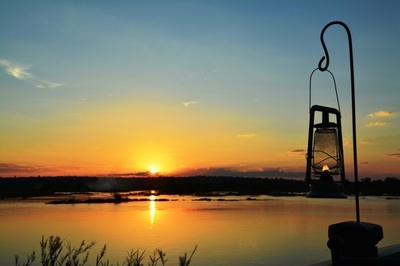 Unless you are lucky enough to experience a full-blown dramatic African thunderstorm that gets the heart racing out of excitement and sheer joy of life, then you merely make your way to The Royal Livingstone Lounge where high tea is served or to the utterly atmospheric colonial Travellers Bar.